Carved wedding band, early 20th century - HW? I've been looking for information about a carved wedding band, white gold, 14K, that I've had for several years now. The ring has a floral pattern carved around, maybe orange blossoms, and I think it's probably 1910s-1940s, although I wouldn't swear to it. I'm attaching a horrible picture of my horrible artwork of the hallmark, but I couldn't figure out how to photograph it. 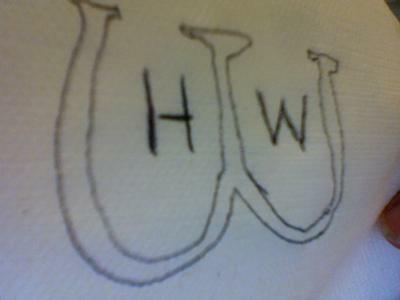 It's an HW inside of what may be a larger W, or maybe inside of two horseshoes side by side. I doubt the ring was very expensive, but I'm curious about it. There are bride and groom's initials carved inside too, but they're too hard to read. No wedding date is visible.